Performance anxiety or stage fright can be a real pain for those who love to sing. The important thing to remember is that a moderate amount of anxiety is normal, and everyone gets it in some form. Even after years and years of performing Barbra Streisand still threw up backstage before most of her performances! 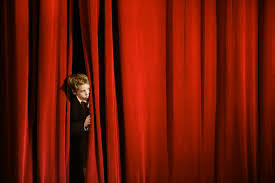 So what is stage fright? What if, instead of getting rid of your nerves, you simply need to know how to control them so they don’t affect your performance? It is possible to overcome stage fright by controlling the butterflies in your stomach. The first stage of this is to examine exactly what happens to you when your get nervous on stage. Does your breathing get shallow? Does your throat feel tight? Do your legs shake? etc. Once you’ve identified exactly what goes on you can prepare to fix it before it becomes too big of an issue. If your breathing is the first thing that changes, try to take a slow, deep breaths. Breathe comfortably down into your stomach and release the air nice and slow. If your throat tightens up, ask your singing teacher for some vocal tricks you can use to relax it before and during your song. Working with your singing teacher can help you build confidence in your vocal technique to ward off vocal anxiety issues. If your legs shake – opt to sit while you perform or, if you have to stand, ladies should try to avoid wearing high heels which will make you even more unsteady. Find the most logical solution to your anxiety and watch how quickly you can begin to hide your nerves. Even if you can’t completely overcome your stage fright, your nerves may not be evident to the audience if you have them under control. As they often say – fake it ’til you make it. If you can convince your audience you’re not nervous then you’ll begin to feel it yourself as well. 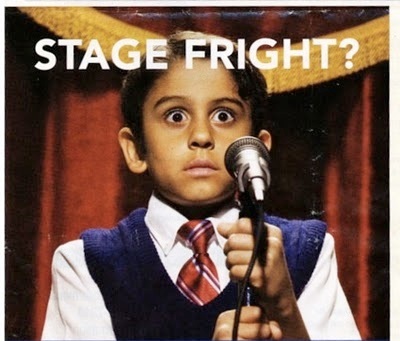 What’s your tips for overcoming stage fright? Leave us a comment below! 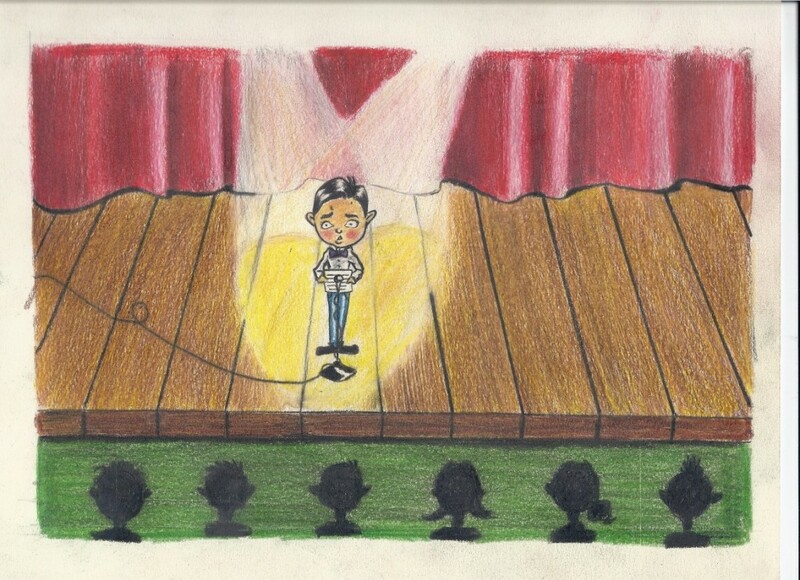 I used to have tremendous stage fright, especially when I was in college. There are two things that really helped me more than anything, but they were more of a building process, not a last minute fix. First, after having a couple of bad experiences trying to sing my college juries and competing at a NATS competition (with a not-so-great technique and a case of bad allergies), I was given some rather mean comments from the judges and voice staff. These comments really hurt my confidence and I developed a large fear of performing in front of my peers and teachers. I knew I had to overcome this fear so I could sing my senior recital, which was a requirement to graduate with my music degree. So, about four months in advance, I started mentally training. I would lie in bed every night and practice singing through my recital until I drifted to sleep. I mentally (almost as much as I physically) practiced my tough spots in my songs, my posture, stage presence and I would even practice my attitude and response to those audience members that frightened me. In my mental practice, my voice always worked and I never messed up. So, after about four months of constant physical and mental practice, I was able to perform my entire recital, for a packed audience of music majors and voice teachers, without any problems. I was a little nervous, but as soon as I started, those butterflies went away and I totally enjoyed singing the next hour for a tough audience! It was a huge victory for me! While mental practice was a big step, I still battled stage fright from time to time because of some poor technique issues. Everything had a major affect on my performance…allergies, nerves, poor technique. I could not trust my voice, so I actually stopped singing for a while. Plus, some of those mean comments from college didn’t go away after I graduated, and I was still fearful at times. I still performed, but I chose to sing in groups and choirs thinking at the time that that was all I would ever be able to do. It wasn’t until I was sick of ‘hiding” and my desire to learn grew strong enough, that I discovered another big component in overcoming stage fright, and that was getting my vocal technique “together”, but I didn’t know how. I needed to find a different way to sing, other than the way I had been previously been taught. The way I learned to sing in my younger years, caused a lot of “holes” in my technique and limited my understanding of how to sing and confused me. When I sought out a much better technique, I learned so many things that helped me overcome all my poor habits and my voiced changed. As my vocal ability improved, so did my confidence. Now that I have a healthy, well-balanced voice, I can’t stop singing and performing. I absolutely love it because I am much more confident when I sing. I wish I had learned to sing this way when I was young because so many years were wasted! All is not lost, though, because I can use this knowledge to help my students so they don’t have to go through what I went through. There are many good tips for singers to use on the spot, but the most effective tips for me was developing some toughness through mental practice and getting my technique strong so I could depend on my voice. Now that those things are taken care of, it is easier to deal with some nerves every now and then. When the butterflies and the dry mouth hits, even when I struggle with allergies, my voice and my mind are much better prepared to handle it and I can still perform well.